Zoton Fastab Orodispersible 30 mg 28 tabl. Stomach acid is released during digestion of food. The stomach has a protective lining to prevent the stomach acid attacks. If that lining is damaged a stomach ulcer can occur. In reflux conditions acid rises from the stomach and ends up in the oesophagus. Zoton FasTab heals ulcers, treats irritations and lowers the production of prostaglandine (hormonal substance produced by the body). In combination with antibiotics Zoton FasTab treat the Heliobacter bacteria. Take Zoton FasTab half an hour before breakfast. It is important that you don't chew the tablets but swallow them whole with some water. Let the orally soluble tablets melt on your tongue and swallow it with saliva. The doctor will define the correct dosage for your condition. Always check the label of Zoton FasTab for the correct dose and the way of taking them. Do not stop taking this drug of your own accord, but always consult the doctor. Your symptoms could come back. Most side effects are temporary and disappear after a short time. If you have questions, don't hesitate to consult the doctor. Always inform the doctor of all other drugs you might still be taking to ensure no interaction with other drugs occurs. 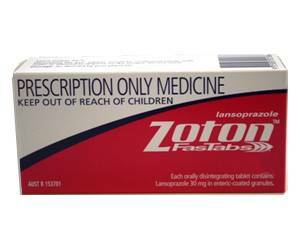 Zoton FasTab (lansoprazole) is available as Zoton FasTab (lansoprazole) 15 mg 28 tabl. and Zoton FasTab (lansoprazole) 30 mg orally soluble 28 tabl. Store Zoton FasTab under 25ºC in the original packaging because the drug is thus better resistant against humidity. Do not use after the expiry date.